Farmers, school teachers, village clerks and rural women are taking banking to the doorstep of people in far-flung regions across the country. Malubai Maruti Takde, a 55-year-old grandmother in a Maharashtra village, walks past a sugarcane field as the sun sets over low hills some distance away. She stops near a haystack to meet Dipali Sardar Patil, who fishes out a mobile phone and biometric scanner from a bag, punches a few numbers, hands over some money to Takde and walks away. It's a routine that is repeated almost every other week. Takde either deposits or withdraws a little cash from Patil for a saree, a gift for her grandchildren or just to go to the local fair. Patil is a twenty something mother of two whose husband is a peon in the Vamte village panchayat. She speaks little English and lives in a traditional house close to a field, far from the hi-tech world of India's cities. But she handles the gizmos in her hand with unusual flair. She says the gadgets have helped change her life in many ways: they have given her more confidence and taken her out to meet a lot more people. "Bluetooth se connect hota hai (They are connected through Bluetooth)," she says, with the air of a professional. Her tech-savvy manner and professionalism may seem incongruous, but they are not that unusual. Shahji Tukaram Patil (seated, right), a banking representative in Maharashtra, says the nearest bank is miles from his village. 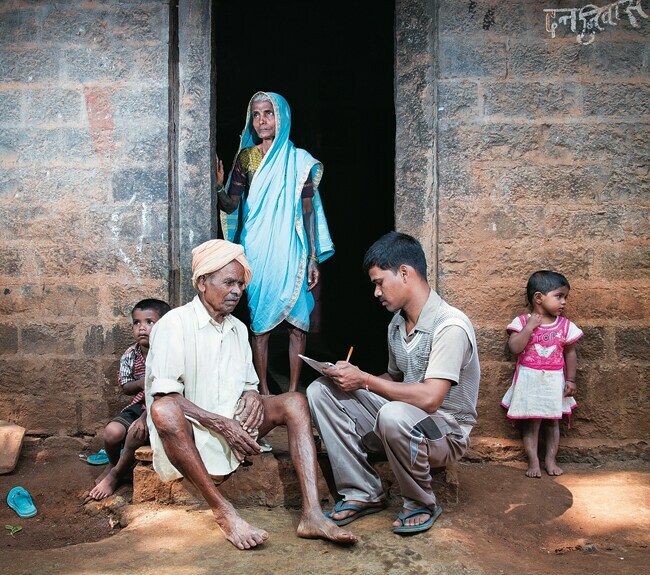 Patil is one of thousands of so-called Business Correspondents, or local bank representatives, who are taking banking to the doorstep of people in far-flung villages across the country. 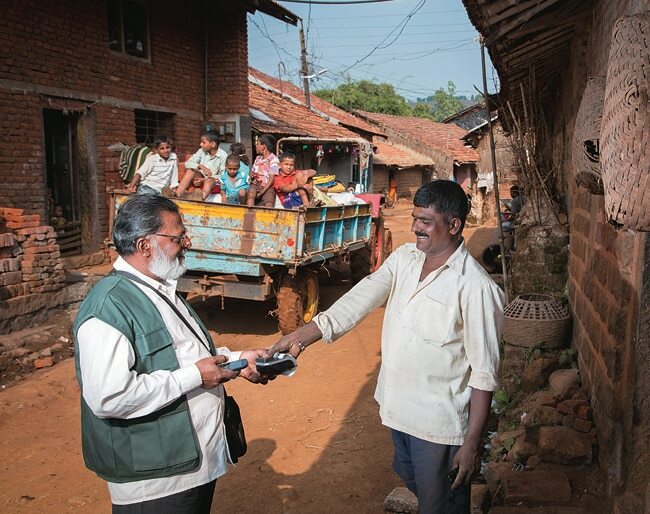 They help mostly illiterate Indian villagers understand the basics of banking in line with the Reserve Bank of India's 2009 guidelines on bringing the unbanked population into the fold of banking. The central bank said the process of financial inclusion involved access to banking and credit markets as well as financial education. Though still a relatively new concept, India already has more than 200,000 business correspondents who are as diverse as their rural customers : they could be carpenters, school teachers, village clerks, farmers or rural women with no education whatsoever. Take Dagdu Kisan Sutar, a 28-year-old carpenter from Mahavade village, for instance. Sutar came back to his village after a stint in the city in the construction industry, and became a business correspondent about seven months ago. The decision made sense: Mahavade lies about 10 km from the nearest bank that stands between thatched huts and traditional village houses with colourful motifs. Already, Sutar has about 70 customers who he helps when he's not bent over his carpentry tools in his workshop near his house. Zohair Mustaq Qureshi says many of his customers are students who work part-t ime and save a rupee a day. Many business correspondents juggle two or sometimes even more jobs, but some make a living from doorstep banking . Take 40-year-old Ramkishore Yadav from Madhya Pradesh's Hoshangabad district, for example. He was part of the non-medical staff at a private hospital in Kesla town for some years before he started a small computer kiosk to teach local youth the basics of computers. About two years ago, he came across a State Bank of India advertisement in a local newspaper for business correspondents in this predominantly tribal district. A few phone calls later, Yadav was in a training session where he learnt how to open accounts and operate a biometric machine that reads fingerprints. Back in Hoshangabad, he started working with the local population: initially, he used to go to villages with State Bank of India employees, who would organise awareness campaigns. But later he began bringing in more clients on his own. Yadav's efforts have paid off: today, he has close to 7,200 customers under his belt. Do his clients understand deposits and withdrawals, or tenors and interests? Yadav says they were mystified initially, but understood the concepts quickly. It didn't take them long to start coming with the cards, and depositing or withdrawing their cash. He says most of the people who come to him are labourers looking to withdraw money. Only one in four people deposit money, mostly small amounts between Rs100 to Rs200. Another business correspondent, Malkhan Singh of Madhya Pradesh's Panna district, says it typically takes at least a year to convince customers about the benefits of banking. Singh, who comes from a family of farmers, says his mode of operations is to visit gram sabhas in every one of Panna's 20 villages and explain the virtues of banking to villagers. Being a business correspondent isn't the most lucrative business: they earn as little as 50 paise a transaction and there is little room to increase the transactions because there are only so many people in an area. But people are attracted to the job for other reasons. Archana Yuvraj Rohile of Mahavade village was not deterred by the small size of the transactions. She used to work in Kolhapur, but did not get enough time with her husband and two children. She returned to the village where she now does household work and tends to livestock until late afternoon when her husband leaves for work at a spinning mill. That's when she finds time to start her job as a village banker. "I ask my kids to watch TV and go out for work," she says. "People call me madam in the village, because I tell them what to do. The government has appointed us for our benefit, that's why I do it." Villagers say banking correspondents have changed their lives. 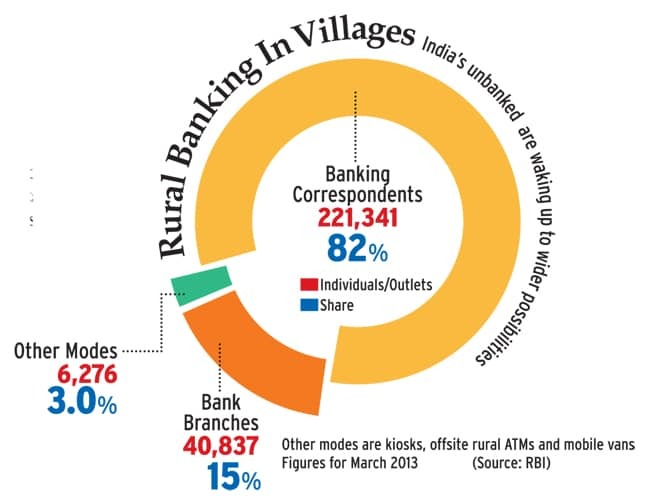 Several remote areas in India do not have a bank and only a small percentage of the population has a bank account. Earlier, pigmy agents, or agents of microbranches of banks who travel from village to village, were the only contact points for a bank. If people missed them when the agents came around, there was no alternative but to wait until they came back. Not any more. "Now they (business correspondents) are always around," says Ravindra Lohar, who runs a small shop selling halwa and mobile recharge coupons. The numbers are telling. Banking correspondents have opened 8.12 crore savings accounts with deposits of Rs 1,822 crore across the country already. Many of their customers are farmers, small shopkeepers, labourers and rural women who have never had access to a bank until now. Banking correspondents say most of their customers are women, some who save in tens of rupees. Zohair Mushtaq Qureshi says many of his depositors are students who also work part-time and deposit as little as one rupee a day. "We don't have a bank in our village, the nearest bank is many kilometres away," says Shahji Tukaram Patil, a 32-year-old father of two sitting in a two-storey wooden house in a Maharasthtra village. Banks say they normally look for people with an entrepreneurship streak when they appoint business correspondents. Given the small transaction amounts, it is not always easy to make a lot of money in such rural banking. Nevertheless, according to industry estimates, some entrepreneurial representatives can make up to Rs50,000 a month. "One of the biggest reasons why we pick up some people is an entrepreneurial streak. It is not a nine-to- five job," says Abhishek Pandit, director, business services, AISECT, a non-profit organisation that trains business correspondents. "We want him to serve the villagers; so only if he is entrepreneurial, will he succeed."